We each make a difference, through our presence and our absence, through our actions and through our inaction. By clarifying our purpose it becomes clear how our existence contributes to the betterment of life, When we clarify our goals our priorities are made clear. Inspired meaning infuses our lives. Breathe in new possibility. Embrace Divine Purpose. It will help you calm the waters or ride the waves. Consider the thoughts below from Chapter One of IF YOU CAN’T CALM THE WATERS, LEARN TO RIDE THE WAVES – HOW TO SUCCEED IN TURBULENT TIMES. For more and to order, click this link and use discount code D6BTQE42 at check out for 30% off. You are the offspring of those who persevered through trepidation, trials and tribulations. Not only can you make it, it is your legacy. We have the power to define our experience; indeed, that is what we do. Remember to embrace “Inspirational dissatisfaction.” Be grateful yet discontent enough to be inspired to make a difference. Think you can or think you can’t. Either way, you are right. Creative possibilities emerge as we interpret and respond to the same stuff with anticipation. So find a quiet or inspired space and ask yourself, “What is most important to me? How can I make a difference while loving life? How can I use my divine gifts? Write your answers. Get input and reserve your right to filter and assess. Choose, act, adjust and enjoy. You have already begun. Thank you for BEING the difference you want to see in the world. Sometimes in the midst of a mighty effort we may find ourselves derailed. The wind knocked out of us, disappointed and disillusioned, disgusted with ourselves or/and our situation, we become disoriented. Okay, this is undesirable to most of us, extremely uncomfortable at the very least. Maybe being unemployed will lead you to starting your own business or going back to school. Maybe, just maybe, there is something more for you than what you lost. You may have heard the saying, “some people are with you for a reason, a season, or a lifetime. We don’t know which it is, we can only make the most of it. Sometimes you have to be knocked on course to get it right. Sometimes we are held back only to find a better path. 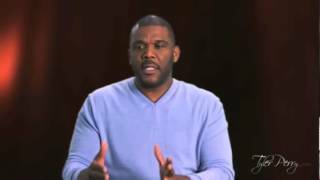 Tyler Perry, producer, director and philanthropist says that because doors were closed, it forced him to create his own access way, to own his own path. Think about this in your life and recognize your opportunity. Set your goals to live in Divine Purpose.